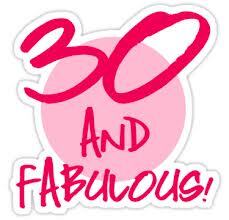 So, I turned 30 yesterday, and I'm excited about it. Why not be? Who could complain about another year of life and still being here to enjoy so much. I never mind telling my age, because I'm proud of it, and I decide what it looks like and how it feels. I hope you all do, too. I thought today would be perfect for sharing 30 reasons turning 30 is great. Some are pseudo-personal, some I think many of us can share. 2. Looking forward to another year and many more. I have amazing people around me, both blood-related and not. I couldn't be more appreciative of the support system I have. Plus, evidence shows, I have pretty good genes! 4. My concerns in life are different. Things I thought were big deals in years past have proven to not be so major, while I've learned the proper priorities of true womanhood. Sometimes ladies go through tough times in friendships, but by now, we have a better understanding of true friendship and how to be a friend. I have wonderful friends, and love them dearly! They take work. Now having a better understanding of myself and what I want, I know what it takes to be in a happy and healthy relationship. It is important to be a good person, and be able to receive one as well. 8. I'm a part of the Fashion Law Movement. 9. Social awareness is at an all time high. I love charity, community service, and doing for others. It's important and more impactful than what we may realize. Surely my career in government is part of this, but doing my part on my own is essential as well. Gotta keep it up! 10. I'm a dime in my own right. Know what to care about, what not, and I'm content with who I am. Self-confidence is one of the most critical things a person can have. While being self-aware is important to continuing to improve, loving yourself trumps everything. 11. I remember not having a cell phone. I was actually a teenager without social media as it is today. We made it somehow. 12. I'm always ready for change. It's the only constant in life. Comfort is great, but it won't last long. 14. Law school is a distant memory. I'm thankful for my law degree...and even more thankful I'm using it, rather than working on it. 15. I don't have to be out all night or every weekend to have a good time. 16. Partying in the day time is just as fun as partying at night. 17. Knowing who I am and what I want to do. This is worth repeating. Being confident if who you are and what you're doing is so important--at every age. 18. My career is in check, yet I'm still building. 19. I'm in a position to help people behind me, and learn from those ahead of me. 21. I have 21 line sisters whom I couldn't imagine life without. 22. Terms like "nowadays", "kids these days", and "when I was young" are getting more rotation in my vocabulary. 23. I push myself to be fearless. 24. My competition is the person I was yesterday. 25. I know the importance of giving and receiving. 26. My group of friends is a reflection of me, and I hope I am a positive reflection of them. 27. I realize my parents were right about a lot of things. 28. Talking about work is common and acceptable. 29. I have so much to look back on, and even more to be excited about in the future. 30. Next year, I'll be 31!